“Applications are being built to meet the needs of increasingly dispersed workforces." 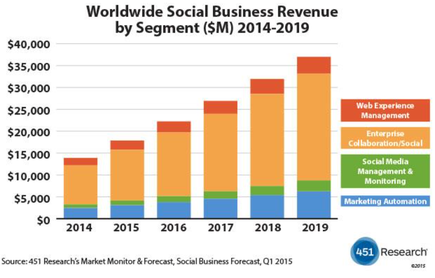 The Social Business Applications Market is expected to grow from $13.9 billion in revenue in 2014 to $37.0 billion in 2019. The specific market segments included in 451 Research’s analysis are Marketing Automation, Social Media Monitoring & Management, Enterprise Collaboration/Social, and Web Experience Management. As end users and enterprises continue to embrace the Social Business movement, 451 Research believes this will lead to a market CAGR of 22 percent from 2014 to 2019. This forecast is based on 451 Research’s new Social Business Market Monitor service, which presents data generated via a bottom-up analysis of 145 vendors that participate across four Social Business segments. Those segments include 50 Marketing Automation participants, 29 Social Media Monitoring and Management participants, 65 Enterprise Collaboration & Communication participants and 22 Web Experience Management vendors. “Business applications are finally, if still slowly, moving from silo and legacy status toward an integrated ‘demand chain’ that can pull together back-end, internal, and customer-facing processes and transactions,” says Alan Pelz-Sharpe, Research Director, 451 Research’s Social Business Applications channel.